Ben Roethlisberger put up a monster stat line for the second week in a row, this time in a losing effort. What gets lost in the traditional stats are the sheer number of bad throws he’s made, as his teammates have really helped him after the catch. He’ll need to hone it in with better efficiency to put the Steelers in the win column next weekend. Wide receiver Antonio Brown was limited, despite getting targeted an absurd 18 times, which resulted in just 67 yards. Brown was hurt by Roethlisberger’s inaccuracies and he had to fight for every yard he gained. The Steelers struggled mightily in coverage. Some struggles came as miscommunications, others were poor mismatches, like having edge defender T.J. Watt covering Sammy Watkins one-on-one on a vertical route. If they didn’t have enough problems with coverage, they didn’t fare much better after the catch. Mike Hilton and Artie Burns both missed a handful of tackles, and there were plenty more missed by others. Outside of a couple miscues like stepping up too far in the pocket and tripping over his center causing a sack, and dropping a snap under center, it was an excellent outing for quarterback Patrick Mahomes. He took care of the ball and picked apart the Steelers’ coverage throughout the game. Travis Kelce ran open on seam routes all day and was able to haul in a few catches between coverage zones to pick up big yards. After starting off the year with a lackluster outing, he bounced back with his second multi-touchdown game since 2016. When a defense allows 442 yards through the air and 37 points, it’s usually not going to result in many good defensive performances. 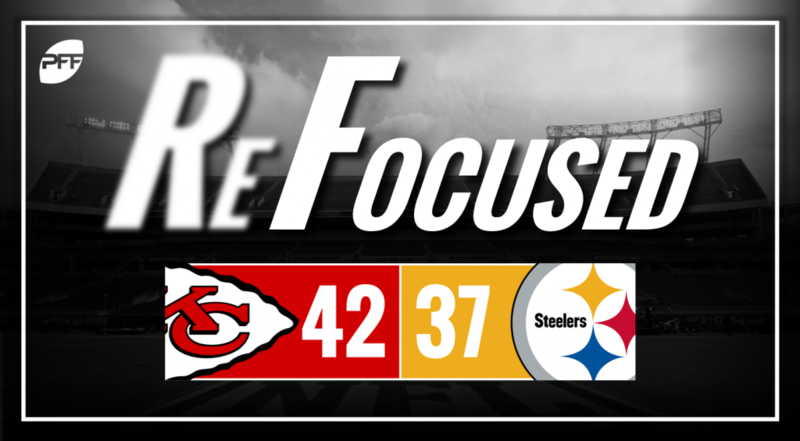 A notable weak point for the team was the ability to cover opponents and despite adding Kendall Fuller via trade this offseason, who played a fine enough game, the unit was continually gashed by the Steelers’ playmakers. If there was a small positive on the Chiefs defense it was the play of edge defender Dee Ford, as he was able to generate a couple of hits and several hurries on quarterback Ben Roethlisberger. This is the second-straight game in which Ford has stood out, which is a good sign for a former first-round draft pick who has struggled thus far in his career. Pittsburgh: Roethlisberger had his chances but was inconsistent against a defense that easily could have given up another 21 points. Kansas City: A number of Chiefs’ skill players showed well, but the standout performer was Patrick Mahomes, who consistently found the open receiver by exploiting the mismatches.